Sneak Peek! You make my Life Bloom! Welcome back to my blog. 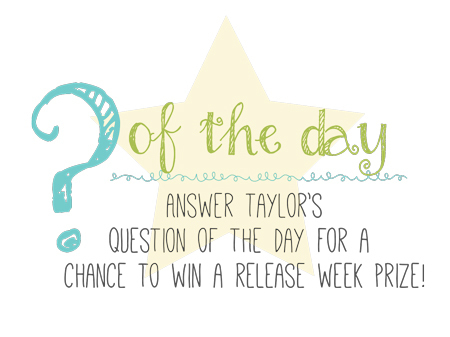 I am sharing sneak peeks of new products from Taylored Expressions today. Yesterday was day #1 of the sneak peek. There are some fantastic new stamp sets, die and embossing folders to be released later this week. I have a gorgeous new die to showcase today. It is called Full Bloom. This die is a floral die which die cuts the petal partially. 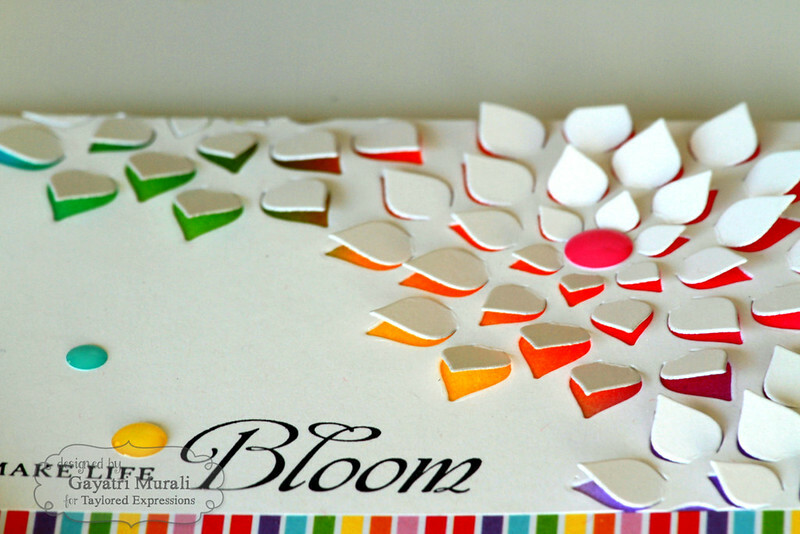 Then there are dies for cutting out individual petals as well. So cool! I LOVE this die. As always I made couple of cards using this die. Make yourself a cuppa and enjoy the post. I used the die to die cut three times on the top right corner of Sugar Cube panel. Then on a Sugar Cube card base, I adhered the rainbow striped pattern paper from Taylored Expressions Rainbow Bright 6×6 paper pad. On the top of the card front, I sponged distress inks in rainbow colours. I used Picked Raspberry, Candied Apple, Carved Pumpkin, Mowed Lawn, Mermaid Lagoon, Mustard Seed and Wilted Violet distress inks. Then I layered the die cut panel on top of the card front. 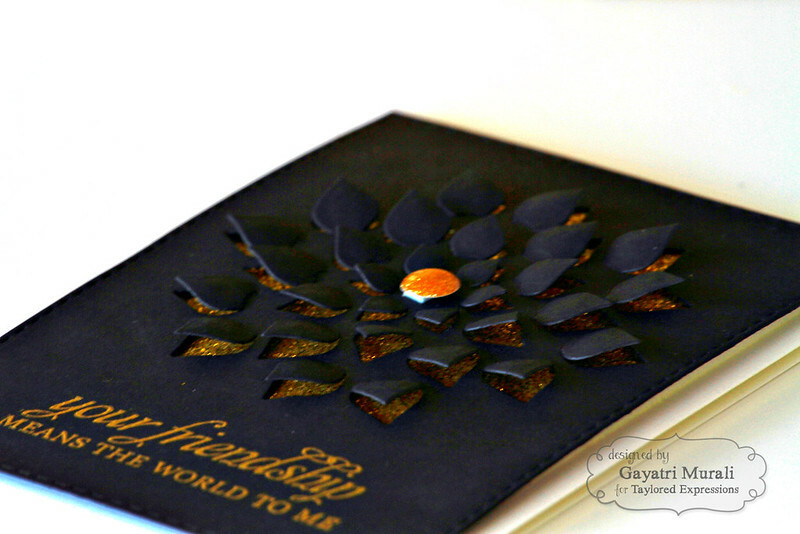 I stamped the sentiment from Rosy Posey stamp set from Taylored Expressions in black. I lifted the partially die cut petal to show the colours under it. You can see them in the photo below. And finally added sparkly enamel dots from Doodlebug. Here is card #2. On this I used the Full Bloom die as my focal point. I die cut Oreo cardstock using the largest of the Stitched Rectangle Stacklets and then die cut the Full Bloom at the centre of the panel. I gold heat embossed another sentiment from Rosy Posey stamp set below the flower. I used a round edge tool on the petal from the back side to give it a puffed look. 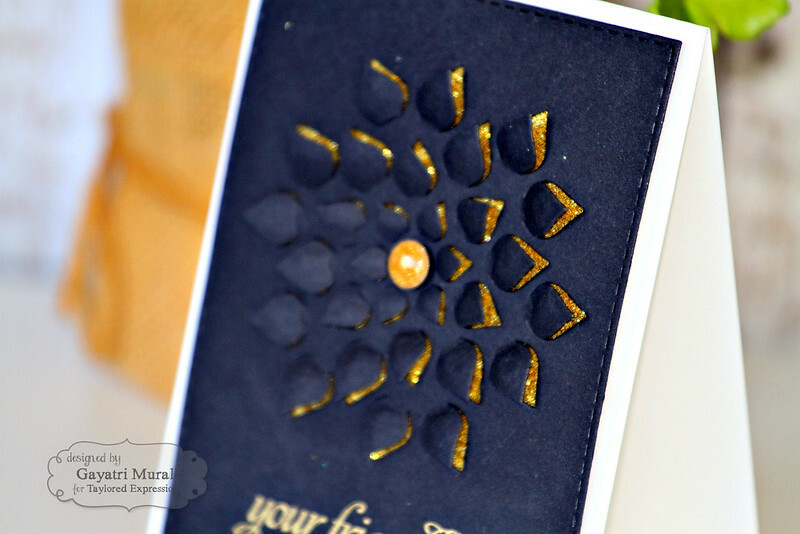 Then I layered the panel with gold glitter paper so that the gold glitter shows through the partial die cut petal. I simply adhered this panel to a Sugar Cube card base. Then I added a large gold glitter enamel dot from My Mind’s Eye to finish off the card. 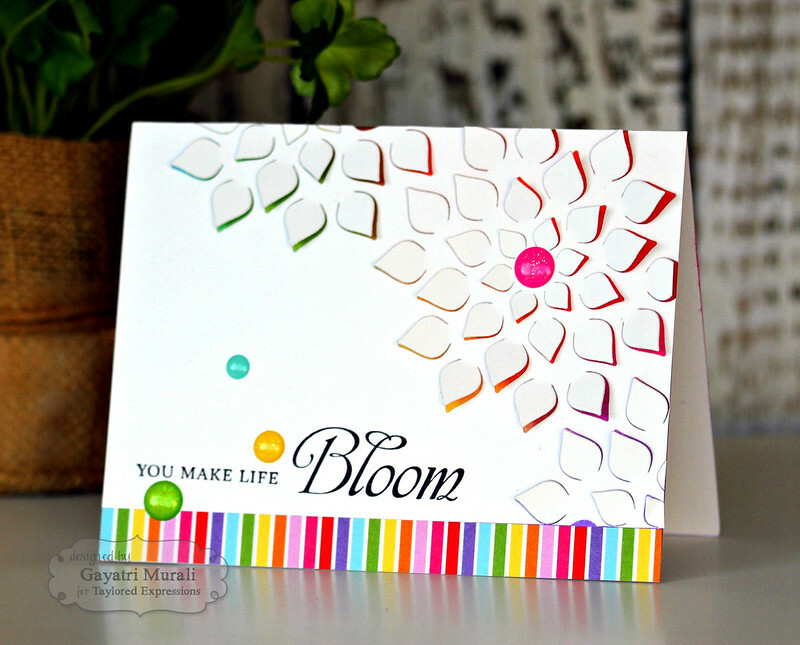 Love the dimension the partial die cut petals gives. 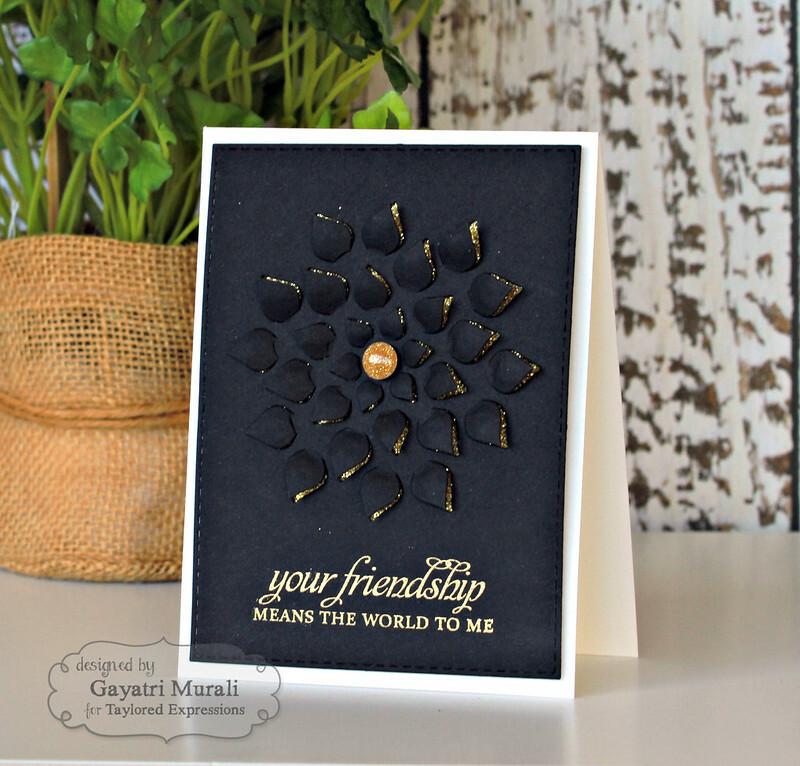 Oh My GOODNESS Gayatri, These are BOTH stunners! You have rocked this release RIGHT HERE! Love them both! EEEEKK!!! ♥ THEM!! !